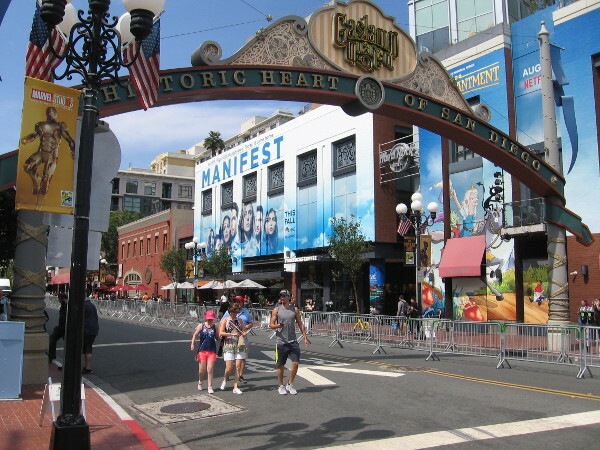 twitter – Cool San Diego Sights! 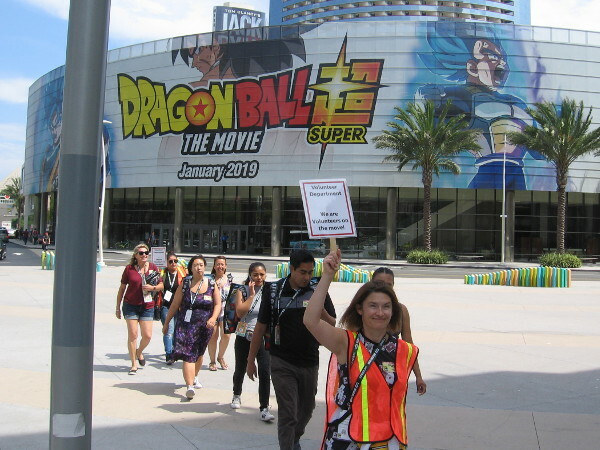 Fans converge for SDCC 2018 Preview Night! 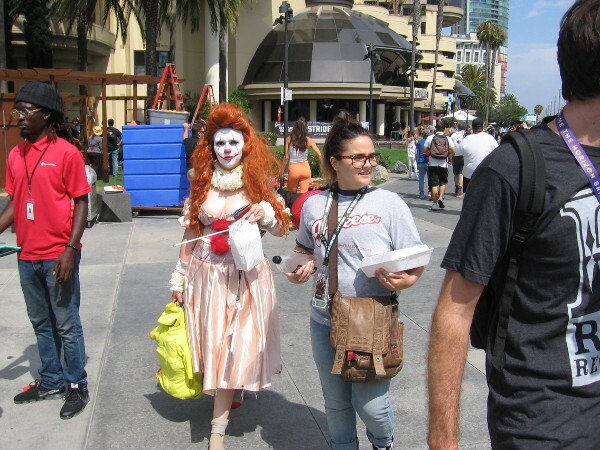 A line of Comic-Con volunteers passes by my camera the afternoon of Preview Night. 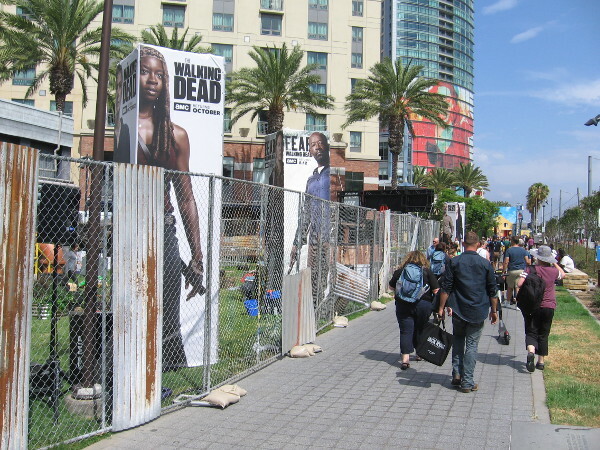 I didn’t have a pass for Comic-Con Preview Night this year, but there was still lots of cool stuff to see just walking around the convention center late Wednesday afternoon! 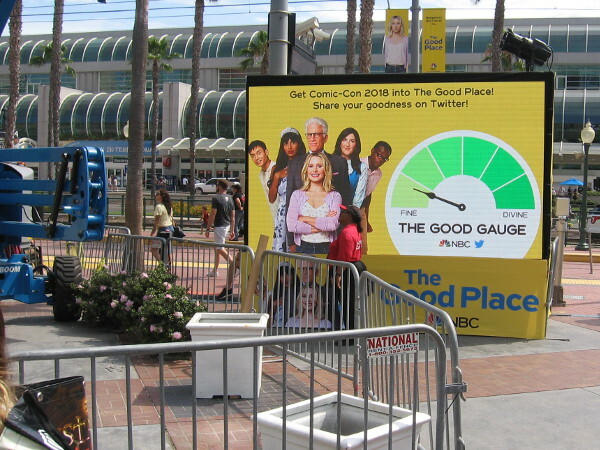 Pop culture fans from around the world are converging on San Diego! Syfy has a bunch of bus wraps again for 2018 San Diego Comic-Con. 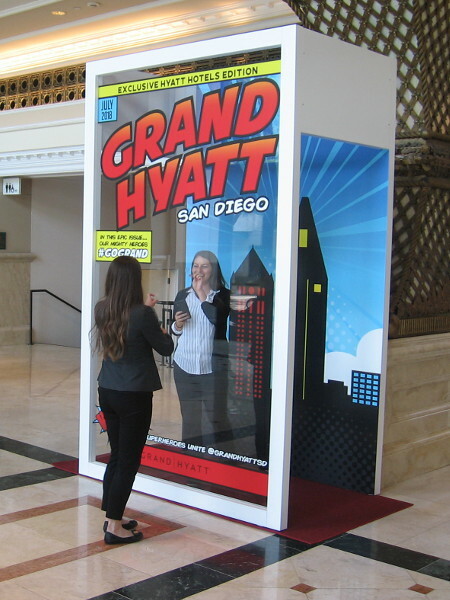 A fun photo booth puts visitors into a comic book at the Manchester Grand Hyatt. Most everyone is converging on the San Diego Convention Center. It’s Preview Night! I spied a few instances of cosplay, but not much yet. Wait for tomorrow! 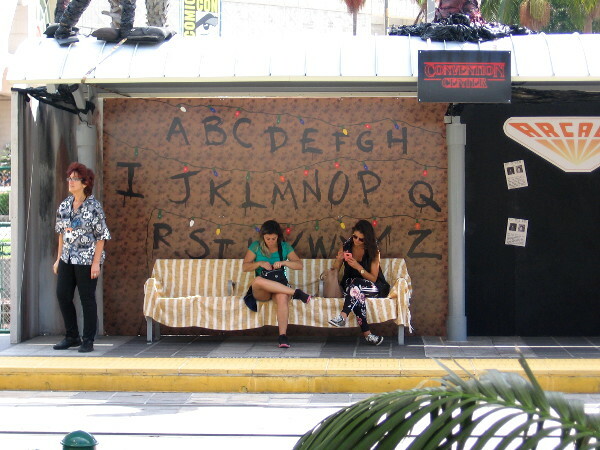 People wait for a Green Line trolley at the Stranger Things station by the convention center. Walking with vigor down MLK Promenade near the Walking Dead. Fifth Avenue will be absolutely jammed tomorrow! Stay tuned! You’ll see loads of pics on Cool San Diego Sights! If you tweet this blog a whole bunch, maybe you’ll move that needle. Maybe not. Uh, oh! 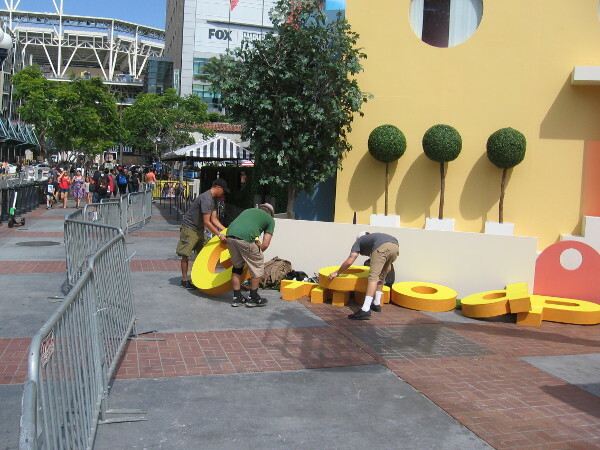 Somebody forgot to put up these big yellow letters! Wow! 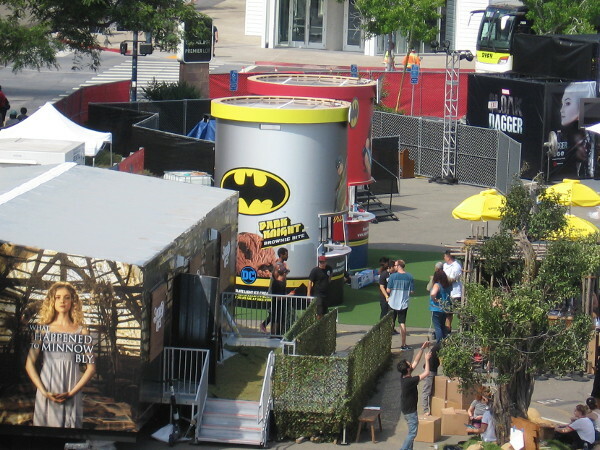 Wonder Woman isn’t the only one offering ice cream at The Experience! Batman has a Dark Knight brownie bite! A line has already begun for Ready Player One. Where’s the Start Play button? Oh, man! 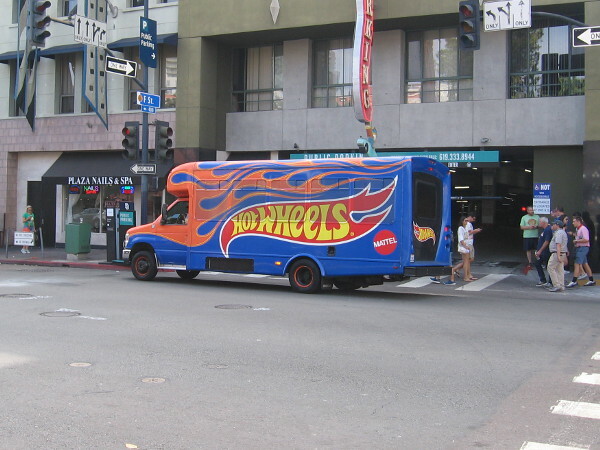 It’s a life-size Hot Wheels! I got my Entertainment Weekly free Comic-Con issue! I’m going to read it as soon as I hit the publish button for this blog post! See you tomorrow! 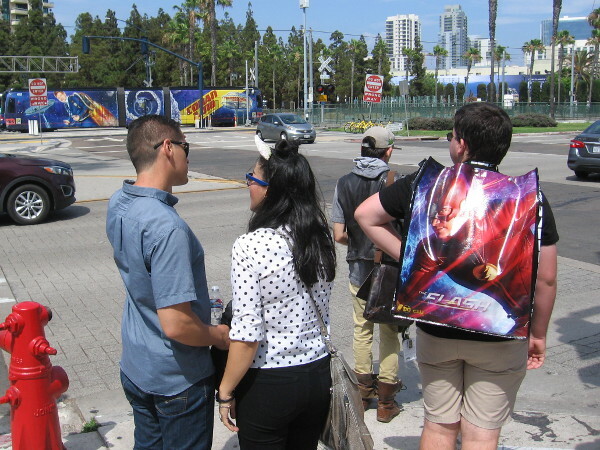 Posted on July 18, 2018 July 19, 2018 Tags blog, blogging, comic-con, convention center, cool, cosplay, entertainment, events, fun, gaslamp, photography, pop culture, san diego, twitterLeave a comment on Fans converge for SDCC 2018 Preview Night! Cool San Diego Sights in many languages! I’ve made a couple of cool changes to my website! Now it’s easy to enjoy Cool San Diego Sights (plus my other blog Beautiful Balboa Park) in dozens of languages! If you’re viewing this page on a computer screen or large tablet, you will see a Google Translate button near the top of the sidebar, on the left side of your screen. Select your preferred language and everything on the website will be instantly translated! If you’re using a smaller device, like a smartphone, click those three parallel lines up at the top of this page and the sidebar will open up. Google Translate should be the first thing you see. I’ve added buttons to my sidebar which make it easy to follow Cool San Diego Sights on Facebook, Twitter, Pinterest and Tumblr! I only update my Pinterest and Tumblr pages every few months, but if you’re on those social media platforms, you might want to check it out! As always, please feel free to share anything you happen to find on any of my blogs. It’s all for fun! By the way, I just finished writing a new short story for my Short Stories by Richard blog. It’s called The Silver of Ice. It’s based a bit on my own personal experience, when I lived on the high plains many years ago. I’m going to Balboa Park in a few minutes to check out something that should be really cool. I’ll post photos when I get home! Posted on November 19, 2017 Tags blog, blogging, cool, facebook, fun, internet, pinterest, reading, san diego, social media, tumblr, twitter, words, writingLeave a comment on Cool San Diego Sights in many languages! Help Balboa Park win funds with a simple online vote! 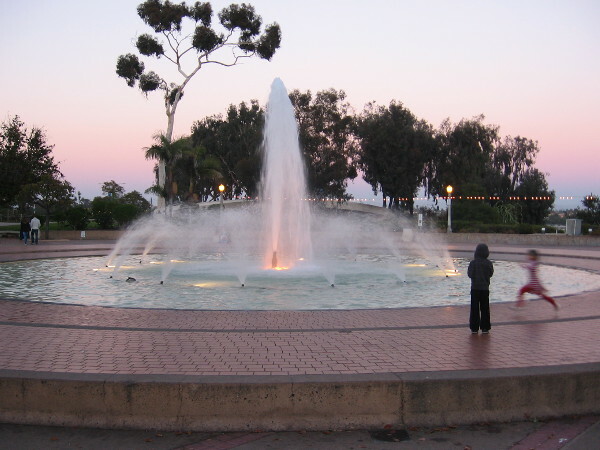 Kids play by fountain in San Diego’s crown jewel, Balboa Park, one of the world’s great cultural treasures. Hey you guys! Please, please, please–can you all do a super easy favor? You know how awesome Balboa Park is? One of our local casinos (Harrah’s) is giving away $100,000 to non-profit organizations that make our community a better place. The Friends of Balboa Park–the organization that oversees the park’s improvements, coordinates volunteers, supports educational programs and historical preservation and other vital projects–needs our online votes! All you have to do is visit this webpage, then scroll down to Friends of Balboa Park and cast a vote using your email! I just did it a couple minutes ago! I don’t know if Harrah’s will email you stuff, but under the law there should be a one click unsubscribe option should that happen. That’s all you gotta do! It would be really, really awesome to help out Balboa Park, which provides joy to millions of people! Many of you know that Balboa Park needs additional funds very badly. So please share this info with other people who have a soft spot for Balboa Park! Let’s get his ball rolling. Let’s try to get thousands of votes! Posted on April 11, 2016 Tags balboa park, charity, culture, education, facebook, friends, fundraising, history, internet, san diego, social media, southern california, twitter, volunteering2 Comments on Help Balboa Park win funds with a simple online vote! Spreading cheer and good deeds in San Diego. 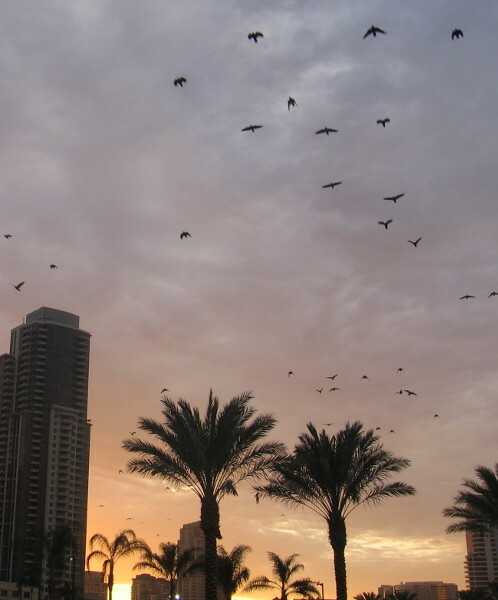 Birds take flight above palm trees in downtown San Diego. The astonishing success of this modest blog is hard to believe. Thank you. This blog’s purpose is simple. 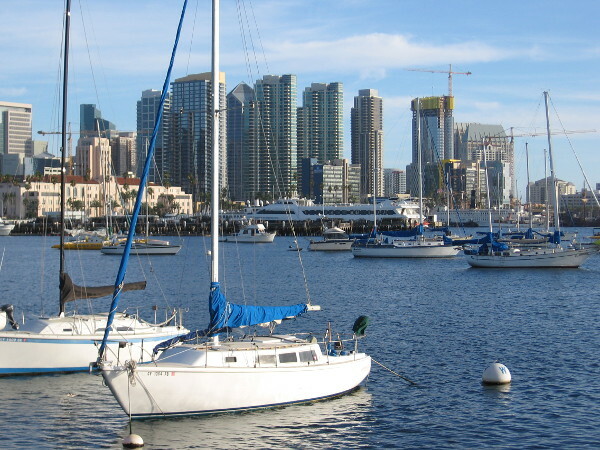 It is to enjoy San Diego, to spread a little sunshine, and to help people who are doing good deeds or undertaking worthy causes. Here are a few charities and positive organizations that would be grateful for your assistance. Please help Stuff the Bus to fight hunger! Foster homes needed for loving San Diego cats! Free books for teachers, schools, hospitals and prisons. Ocean Beach Public Library needs activism and help! 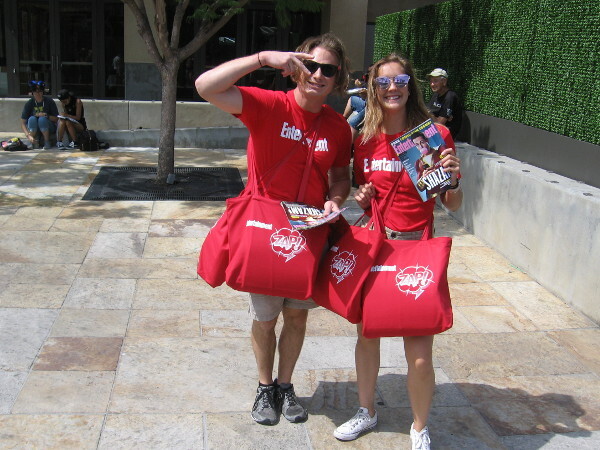 Big red shoes help families heal in San Diego! San Diego walking superheroes fight brain tumors! The Salvation Army celebrates service in San Diego. Spreckels Organ raises funds for Operation Rebound. Cool Corvette car show benefits San Diego USO. Art made of coins helps Rady Children’s Hospital! Glean Queens of San Diego need your help! Help Westview High School Music Outreach succeed! Fill the Boot in San Diego to help burn victims! San Diego breast cancer walkers: the final mile! Wasted grocery food turns to art in Balboa Park. 20 Ways To Help the Homeless in San Diego. Kids’ NewsDay benefits Rady Children’s Hospital! Photos of cool pancake fundraiser on the OB Pier! Photos of Coastal Cleanup Day in Ocean Beach! Habitat for Humanity builds a house downtown! Writing a blog opens up an amazing world. Posted on May 25, 2015 March 8, 2018 Tags blog, blogging, charity, facebook, fun, fundraising, happy, life, love, people, san diego, twitter, writers, writing1 Comment on Spreading cheer and good deeds in San Diego.